Charming and I recently had a discussion about the boys and thought it might help them to add more structure to their day. We already had what I felt like was a lot of structure, but there were still many things we tried to fit in sometime during the day or hoped to have time for by chance. So Charming and I talked about some changes and what we wanted to make sure happened each day. Over the last few days we’ve implemented some of the changes and today was my first day alone with the changes. And I’ll tell you what! I couldn’t believe how smoothly the day went!! Everybody seemed happier and more content. There were hardly any disagreements or timeouts. There was a great balance and natural flow between structured time with Mom, free play with Mom and free play on their own. Transitions felt easier. And I felt much more relaxed. Wake up Brother and Boots. Drink milk and change clothes. Morning family prayer, read and highlight The Book of Mormon with Daddy. Say goodbye to Daddy. Do physical therapy exercises in my closet while Boots and Brother play around me. Breakfast while listening to Disney (or other musicals) soundtracks and discussing their characters and plot lines. Put Boots down for morning nap. Do homeschool lessons and household chores with Brother. Pay bills and make phone calls while Brother watches mellow DVD. Wake Boots up after 1.5 hours. 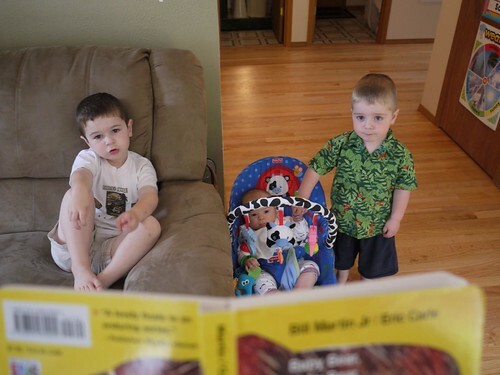 Do homeschool lessons in a “storytime” format with Boots (and Brother and Baby). (Doing this every day is a new addition. I used to fit it in once or twice a week, but will now try to do it every day. Boots loves it and is so incredibly intelligent. I just had to tweak it a little to be engaging for both him and Brother. To make it easier to do every day, I pulled out some new materials and activities that fit Boots’ high-energy learning style). Free play afterward. Lunch while listening to different Disney (or other musicals) soundtracks and discussing their characters and plot lines. Put Boots and Brother down for afternoon nap. Have treasured “alone time” and homeschool lessons with Baby. Backyard chores. Outside free play. Watch mellow DVD while Mom makes dinner and discuss characters and plotlines of the stories. (This is a brand new addition. We resisted it for a long time because we don’t like the boys to watch much TV, but I couldn’t believe how much it helped tone down our late afternoon today! I was able to make dinner uninterrupted (so it was on time!) and the boys weren’t all wound up and irritable when it was finally time to eat. I hope it continues to be this successful). Eat dinner and talk about our days! *Add in Family Home Evening lesson on Monday nights after dinner. We typically do a white board or flannel board scripture story lesson. But tonight we talked about the earthquake on the east coast, following the prophets’ counsel to be prepared, and then practiced earthquake drills of “under or beside” in different rooms of the house. The boys loved it. Gather in Boots’ room. Discuss what we will pray about: 1) What we were each grateful for that day and 2) Any blessings or people we need to pray for. Then we have evening family prayer and put Boots down for bed. Household chores, get ready for bed and read Scripture Stories with Brother. Gather in Brother’s room and put him down for bed. One parent stays behind for treasured “alone time” with Brother (alternating Mom or Dad). Quietly discuss whatever Brother wants to talk about. Looks like a great schedule…but PT in the closet? Is there a reason for that specific location? Sounds great. I am glad it works so well for you. I wondered what homeschooling program you used.